Q. I noticed that some characters used ‘human’ while everyone else used ‘terran’: is that intentional? A. Yes. I have done my best to be consistent in my use of both terms, but if I slipped up please let me know. Q. What is reading the Planet Sarnia series like? A. The best description I can give is that the series does an excellent job of taking you far away to a place you have never been before. 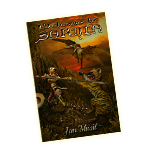 The reader is provided with a well-told exploration of the planet Sarnia where they will enjoy multiple adventures and meet many interesting characters, mostly Terrans, but some aliens as well. Q. How do readers respond to the telling of the tale about Sarnia? A. The virtually universal response, regardless if the reader usually reads sci-fi or not, is a compliment on the great storytelling and comments on how well written the titles are.